johan & nyström Tro, Hopp & Kaffe coffee beans is a concept created by Johan & Nyström and Salong Betong with the intention that everyone should have a good cup of coffee. This coffee is also a tribute to the suburb. We make small good deeds daily by supporting our coffee farmers and various organizations that cater to people and the environment. The ambition of Tro, Hopp & Kaffe (Faith, Hope & Coffee) is to support people in our immediate vicinity. 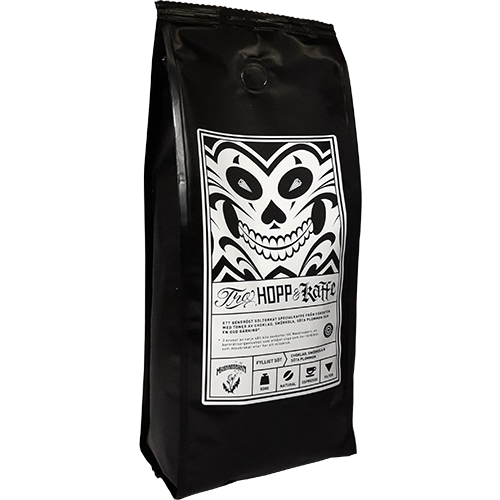 Part of the proceeds from the sale of this coffee goes to Maskrosbarn, a child rights organization that supports children with parents who are mentally ill or have an addiction. The beans of Tro, Hopp & Kaffe are grown in Brazil by Marcos Croce. It comes straight to the roast without intermediaries where the beans are roasted. This type of trade is called Direct Trade and benefits the coffee farmers who do not need to worry about the fluctuations of the coffee market through our close cooperation. The coffee is not sprayed with pesticides or other chemicals and cultivated in harmony with the nature at the farm Fazenda Ambiental Fortaleza in Brazil. It is slowly and carefully roasted to keep all tastes and thoughts that Marcos intended with this coffee when he planted the coffee tree. The seasoned coffee drinker will find tones of chocolate, caramel and sweet plums. Everyone else will enjoy a deliciously sweet and good cup of coffee that can do well without both milk and sugar. "We believe in this good deed and hope that you will appreciate both the act and the coffee as much as we do."